Product code: ES3097 Categories: Sold Items, Sold Watches. The most famous watchmaker in the world, Abraham Louis Breguet first designed and invented a carriage clock for Napoleon Bonaparte in 1812, and since then have always been popular up to today. 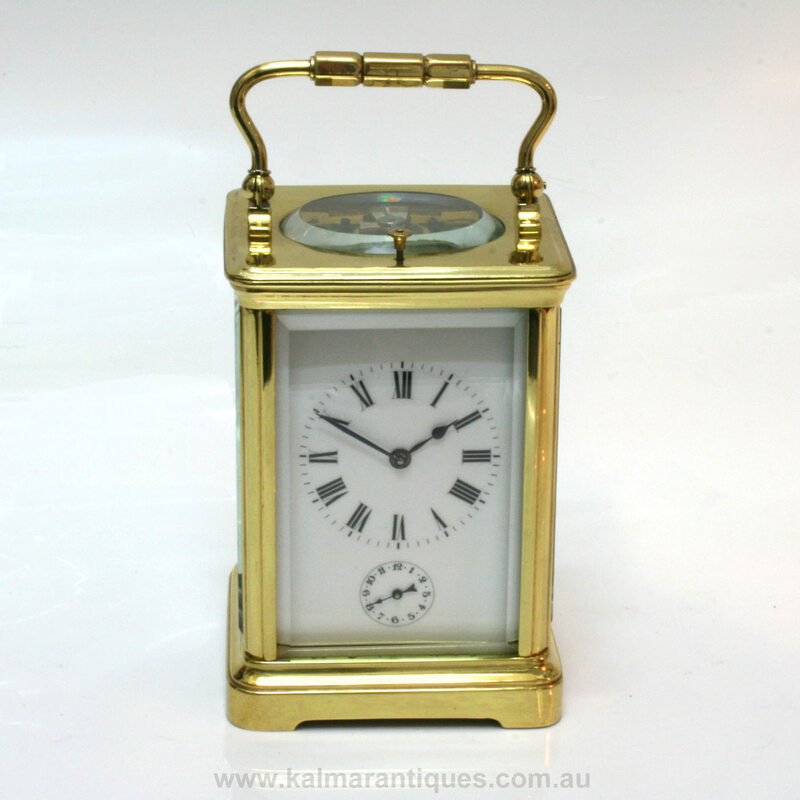 This particular antique carriage clock is one of the highest grade carriage clocks around as it is a repeater carriage clock with an alarm feature as well. What this means is that not only does it tell the time, but it also strikes the hours and will also strike once on the half hour. Then to make this antique carriage clock even more special, by depressing the button on the top, it will make strike the hour that it is in. For example at 3:05, when the button at the top is pressed it will strike 3 times. An added feature of this carriage clock which separates it from even a “standard” repeater carriage clock, which in its own right is superb, is the fact that this carriage clock also has an alarm feature which can be seen as the small dial at the bottom. Typical of carriage clocks and one of the many features that makes them so popular is the glass panels allowing you to see the mechanical movement inside. The movement is an 8 day lever escapement that after a full restoration and service, this antique repeating carriage clock keeps superb time and comes with our 12 month warranty. At the base, this carriage clock measures 8.5cm across by 8cm deep and 12cm high or 16cm when the handle is up.